About a year and a half ago while engaged in the study of alternate currents of short period, it occurred to me that such currents could be obtained by rotating charged surfaces in close proximity to conductors. 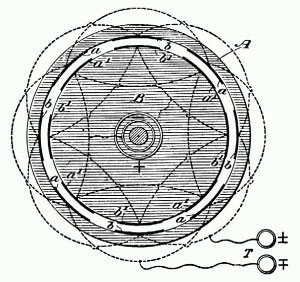 Accordingly I devised various forms of experimental apparatus of which two are illustrated in the accompanying engravings. 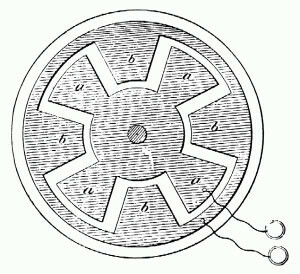 In the apparatus shown in Fig. 1, A is a ring of dry shellacked hard wood provided on its inside with two sets of tin-foil coatings, a and b, all the a coatings and all the b coatings being connected together, respectively, but independent from each other. These two sets of coatings are connected to two terminals, T. For the sake of clearness only a few coatings are shown. Inside of the ring A, and in close proximity to it there is arranged to rotate a cylinder B, likewise of dry, shellacked hard wood, and provided with two similar sets of coatings, a1 and b1, all the coatings a1 being connected to one ring and all the others, b1, to another marked + and –. These two sets, a1 and b1 are charged to a high potential by a Holtz or a Wimshurst machine, and may be connected to a jar of some capacity. The inside of ring A is coated with mica in order to increase the induction and also to allow higher potentials to be used. When the cylinder B with the charged coatings is rotated, a circuit connected to the terminals T is traversed by alternating currents. Another form of apparatus is illustrated in Fig. 2. In this apparatus the two sets of tin-foil coatings are glued on a plate of ebonite, and a similar plate which is rotated, and the coatings of which are charged as in Fig. 1, is provided. The output of such an apparatus is very small, but some of the effects peculiar to alternating currents of short periods may be observed. The effects, however, cannot be compared with those obtainable with an induction coil which is operated by an alternate current machine of high frequency, some of which were described by me a short while ago. While most people won't be able to distinguish between a full-HD and 2K display unless they observe carefully, we'll have to say the One M9+ sports one of the best displays we've seen off late.